TUNIS, Tunisia - Tunisian police arrested the head of the presidential guard Sunday and dozens of others suspected in drive-by shootings, trying to restore calm to the North African nation after the historic ouster of its longtime strongman. Tunisians and observers worldwide were looking for signs about which way the country would turn as a new leadership sought to tamp down the looting, arson attacks and random violence since autocratic President Zine El Abidine Ben Ali was driven from power Friday. 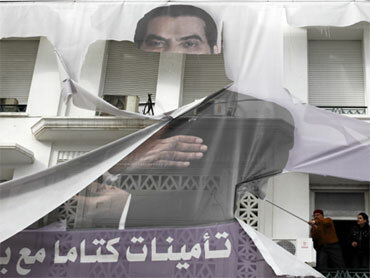 People cheered in the capital of Tunis on Sunday as a massive banner of the former leader was torn down. Police arrested the head of Ben Ali's presidential guard, Ali Seriati, and several colleagues over accusations they had plotted against state security, the state news agency TAP reported Sunday. Other details were not immediately available, but security agents had often fired on unarmed protesters in the last month. More than 50 people have been arrested since Saturday on suspicion of using ambulances, rental cars and civil protection vehicles for random shootings, a police official told The Associated Press. A crowd of 200 in central Tunis cheered Sunday as police drove away one ambulance and arrested its driver. "Criminals are using ambulances to fire on people," a police official in charge of security told the AP, showing his badge but declining to give his name. Dozens of people have died in a month of clashes between police and protesters angry about the repression and corruption during Ben Ali's rule - unrest that ultimately marked the end of his 23-year regime. A soldier fired shots in the air Sunday near Tunis' main train station - which had been turned into a blackened carcass - to warn that a gathering of more than three people is banned under the state of emergency law. Police insisted that gunfire heard overnight was only the firing of warning shots. One soldier stationed near the train station said, "We are with the Tunisians, we are all brothers." A well-known human rights advocate returned home to the embattled - but in many ways, hopeful - country in the midst of an unprecendented power shift for the Arab world. Souhayr Belhassen, president of the International Federation of Human Rights, arrived at Tunis' airport and said her long-repressed countrymen appear poised for unprecedented freedoms. A day of violence Saturday cast doubt on hopes for a smooth transition to a post-Ben Ali era: Assailants attacked police near the Interior Ministry, and looting and score-settling attacks besieged wealthy neighborhoods, department stores and shops. Businesses owned by Ben Ali's family were major targets of looters. The family of the ex-president's wife, Leila Trabelsi, has financial interests in wide-ranging sectors from banking to car dealerships. A branch of the Zeitouna bank in Tunis founded by Ben Ali's son-in-law was torched, as were vehicles made by Kia, Fiat and Porsche - brands distributed in Tunisia by members of the ruling family. Tunisians are especially overjoyed at the prospect of life without Ben Ali's wife and her family. U.S. diplomatic cables released by WikiLeaks discussed the high levels of nepotism and corruption displayed by her clan. Tunisian media reported one brother-in-law of the president, Imed Trabelsi, was attacked by an angry mob at Tunis airport and died from his injuries. The reports could not be immediately confirmed. Fouad Mebazaa, the former head of parliament's lower house, was named interim president on Saturday and quickly ordered the creation of a national unity government that would include longtime opponents of Ben Ali. Elections must be held in 60 days. "We can start to hope," said a founder of the main opposition party, the Progressive Democratic Party, Nejib Chebbi. The question now, he said, is whether a new government will be pluralistic or again dominated by Ben Ali's ruling RCD party. "If the RCD is dominant, we're not out of the woods." The 74-year-old Ben Ali and some family members fled to Saudi Arabia. Other relatives were in France, but authorities said they were not welcome to remain. Tunis' airport reopened Saturday but a state of emergency continued. Thousands of tourists were being evacuated Sunday from the Mediterranean nation, whose wide beaches, deserts and ancient ruins are a strong draw for Europeans seeking relief from winter. Street violence took a new form Saturday with roving gangs sacking homes in at least one wealthy neighborhood and residents, armed with golf clubs, forming self-styled vigilante committees. Others worried about food shortages. "This all happened in three days. Maybe tomorrow we can't eat," said Mohsen Yacoubi. A Paris-based photojournalist, Lucas Mebrouk von Zabiensky, 32, of the EPA photo agency, died Sunday after being hit Friday in the face by a tear gas canister. The downfall of Ben Ali, who had taken power in a bloodless coup in 1987, delivered a warning to other autocratic leaders in the Arab world. The improved quality of life for many failed to keep up with the increased limits on civil rights like freedom of expression. The jobless rate is officially 14 percent, but is thought to be far higher among young who make up more than half of its 10 million people. The self-immolation, and eventual death, of a 26-year-old university graduate selling fruits in central Tunisia last month triggered a series of protests that, relayed by social media like Facebook, spun into general anger against the regime.